Polbase - Reference: DNA polymerase beta substrate specificity: side chain modulation of the &quot;A-rule&quot;. Apurinic/apyrimidinic (AP) sites are continuously generated in genomic DNA. Left unrepaired, AP sites represent noninstructional premutagenic lesions that are impediments to DNA synthesis. 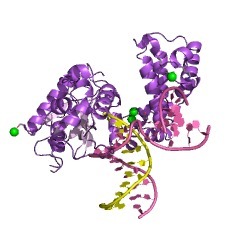 When DNA polymerases encounter an AP site, they generally insert dAMP. This preferential insertion is referred to as the A-rule. 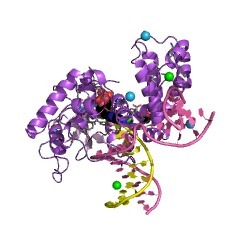 Crystallographic structures of DNA polymerase (pol) beta, a family X polymerase, with active site mismatched nascent base pairs indicate that the templating (i.e. coding) base is repositioned outside of the template binding pocket thereby diminishing interactions with the incorrect incoming nucleotide. This effectively produces an abasic site because the template pocket is devoid of an instructional base. However, the template pocket is not empty; an arginine residue (Arg-283) occupies the space vacated by the templating nucleotide. In this study, we analyze the kinetics of pol beta insertion opposite an AP site and show that the preferential incorporation of dAMP is lost with the R283A mutant. The crystallographic structures of pol beta bound to gapped DNA with an AP site analog (tertrahydrofuran) in the gap (binary complex) and with an incoming nonhydrolyzable dATP analog (ternary complex) were solved. These structures reveal that binding of the dATP analog induces a closed polymerase conformation, an unstable primer terminus, and an upstream shift of the templating residue even in the absence of a template base. Thus, dATP insertion opposite an abasic site and dATP misinsertions have common features.